I had the privilege of typesetting (or composing as it were) large portions of "Krsna, the Supreme Personality of Godhead" aka The Krsna Book. When Brahmananda and I arrived in Boston the first week of January 1970 ISKCON Press was focused on getting the Krsna Book ready to be printed. Srila Prabhupada was concerned about the delays. He wanted it done by February but there was no way that deadline could be reached and the bottleneck appeared to be in the composing. I immediately began doing double shifts so that along with the others (Arundhati, Palika, Nara Devi) we could keep the composing machine running 24/7. Very often I would go through the night while the rest of the devotees were asleep and all that could be heard was the clickety clack of the composing machine and the whirring of the space heater inside the tiny composing room. That winter of '70 in Boston was especially cold. 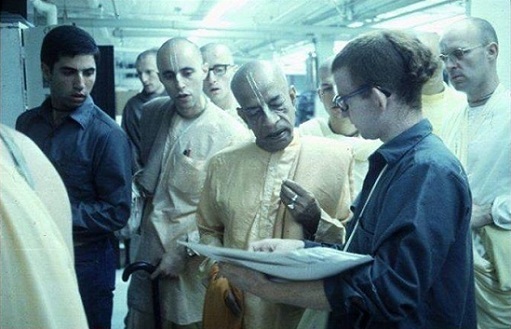 While typing away I was continually amazed at the details of Krsna's pastimes Srila Prabhupada was presenting in this summary study of the Tenth Canto of Srimad-Bhagavatam. I would think to myself, "Wait until the world gets hold of this book and finds out who God really is." I remember getting to the chapter entitled "Wonderful Krsna" and thinking that in essence Srila Prabhupada was introducing us to his wonderful Friend Krsna. Just like in this world if we meet someone who we think is really special—so very amazing—we want others to meet them. So Srila Prabhupada was inviting the world, "Please come meet Krsna ... wonderful wonderful Krsna and come see just how wonderful He is. Perhaps in some small way I feel that about Prabhupada. I want people to meet, through his writings and vani, wonderful Prabhupada. Why? Because he's so wonderful, that's why. This whole process, as Prabhupada once said is simply wonderful.